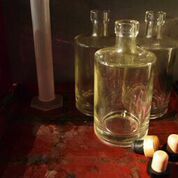 Try our new Capital Spirits +Slow Boat Distillate! We’ve teamed up with Slow Boat Brewery recently to produce special, limited supplies of their Monkey IPA and Maple Brown Ale. 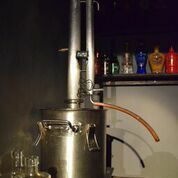 Distillation is a production process whereby you heat a fermented liquor (beer in this case) to boiling point turning it into steam. The gas rises up a column pipe then hits a water cooled condenser where the steam then turns back into liquid and drips down into a collection bottle. Because alcohol boils at a lower temperature than water, we can effectively get a concentrated sample and turn a 6-9% alcohol by volume beer to upwards of 50-60% alcohol volume spirit. The special flavors of the beer also are saved and you end up with a concentrated liquor that has unique flavors of the original sample. What’s on tap ? What have you cooked? Notes of Raisin bread, vanilla and passion fruit followed by hint of pine cone and finish of mango and hop flavors. Where can I sample it? 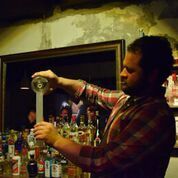 The beer distillates are freely available (while supplies last) at the Slow Boat Tap Room http://www.slowboatbrewery.com/ on Mondays and all operating hours at Capital Spirits Bar & Distillery (www.capitalspiritsbj.com).